Both of these volumes, Larousse Gastronomique and the Oxford Companion to Food are revered in the world of food, yet each effect lessens the mystique behind the almighty title of chef. The reality is simple, a chef is a cook first. He, or she may have other responsibilities true, but first and last a chef is a cook. No food regardless of how grand it may be is conjured up by magic, it has to be prepared, it has to be cooked. Today we have all kinds of chefs running around. Television with their food networks have made the professional cook into a celebrity. We have the angry and aggressive English guy who can make the strongest will break into tears. At the opposite end of the scale and still English, is the youthful, energetic fellow jumping up and down promoting natural, well balanced diets. In between we can find a whole array of men and women, some who have been around for years, others appear and disappear as fast as new fashion trends on the runways. Though haven't you noticed that the ones with an accent somehow sound more foodie when talking about food, it's as if that accent is a pinch of some secret ingredient in the overall recipe. So putting aside television and the iron chefs competing against each other history proves that the professional cook or caterer has been around a long time. The Deipnosophistae of Athenaeaus, a sort of massive how to guide from around the end of the second or the beginning of the third century, claims that “the good cook must penetrate nature, know something about medicine, about the seasons, the setting and rising of the stars in order to be able to prepare food that is nourishing and will be properly digested and exhaled.” Wonder what Gordon Ramsay would say to that? People have been cooking grand, or otherwise, feasts for others for hundreds of years. In Ancient Rome slaves did most of the cooking although the richest people had well paid cooks called coci. Even then some cooks were elevated to fame as gourmets such as Lucullus and Apicious. The Oxford Companion to Food makes a reference to Apicious, a 4th century Roman cook, as the author of the first cookbook, and in the broadest of interpretations of today's title as the first recorded chef. As already stated the title 'chef' is a French word and prior to the French Revolution had not been in use. Professional cooks were known as man-cooks, master-cooks, cook-maids, professional cooks, principle cooks and even chief cooks. It is in the beginning of the 19th century that the term first appeared and quickly spread into other languages. The stage was now set for what could be called 'artist cooks', individuals who took the level of food preparation to new heights of the wow factor. Antonin Careme (Paris 1783-1833) stepped forward to become not only the most influential practitioner of the art of food and its recorder, but also to become a role model for many aspiring young cooks. Antonin Careme was born into a very poor family, and by the age of ten was put out onto the street to fend for himself. He was taken in by the owner of a low class restaurant where he learned the basics of cookery and the fire was lit to last a lifetime. By the age of sixteen he became an apprentice to Bailly of the Rue Vivienne, one of the best pastry cooks in Paris at the time. The passion and artistic genius was noticed by Tallyrand who offered to take Careme into his service, where he managed Tallyrand's kitchen for twelve years. 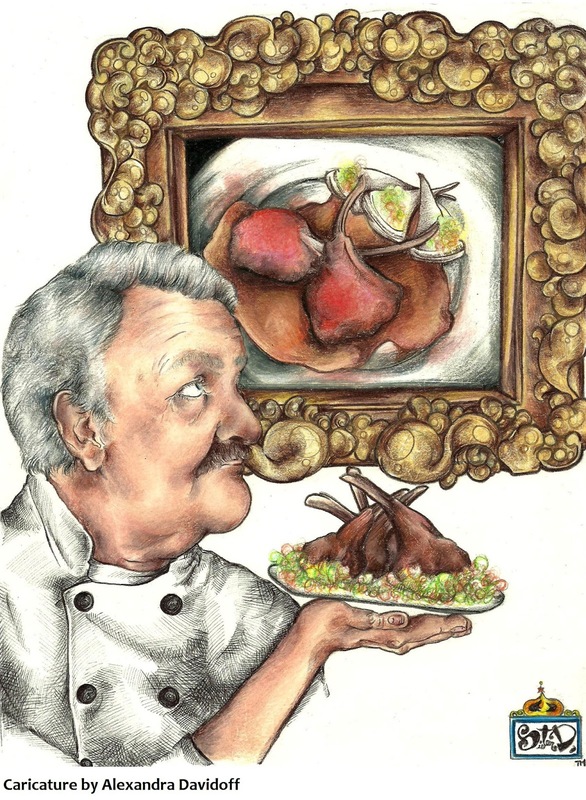 Although Antonin Careme will be remembered through the silent corridors of culinary history as a passionate genius always striving to enhance his knowledge and talent, it was his embryotic status as a celebrity chef that had infused today's warriors in the battlefield of pots and pans, and a celebrity he had become. Antonin had served the Prince Regent of England, later to be King George IV, Tsar Alexander I of Russia, the Viennese Court, the British Embassy, Princess Bagration and Lord Steward, finishing his last years with Baron de Rothschild. Before his death at age fifty, Careme managed to fulfill his greatest wish, “To publish a complete book on the state of my profession in our times.” (Larousse Gastronomique). Although Antonin had produced many written works his greatest endevour L`Art de la cuisine au xixe siede (1833) was published in five volumes, the last two written by his protegè Plumery. Cooking for others has been developing through the ages alongside man's own evolution. In the great halls of the Vikings or of Ancient Greece and Rome, presentation was not a key element. Table manners were not yet thought of and only an abundance of what was popular and edible mattered. As swords were exchanged for guns and cannon, the French Revolution brought with it not only a new view on democracy but also a kitchen with order and purpose. It was a revolution in the world of culinary expertise with room for art and flair. Gradually modern society brought about the birth of TV dinners, take-out food and fast food. Some might say we have regressed to the ancient days of the Vikings only with less gusto. Those who decide to walk the road of a chef are a little different to others in the world of work. In a certain sense art plays a role in cooking for others. After all one of the main ingredients of a well presented meal is the emotional pleasure it gives. By any definition the Arts provide pleasure to the emotional senses of a human being. Yet at the same time that very human being needs food to sustain the very basics of his or her human engine. So why do people want to be professional chefs? Asking some of the young at a local culinary school, the answers were as varied as the individuals themselves, and no one clear motivating factor was evident. For me personally cooking provided an absolute and even selfish pleasure. I enjoyed creating a physical response of pleasure from smell and taste. At no time did I think of feeding the masses, in a fashion my thrill came from having a stranger sit at a table, open his mouth and place the food I have cooked, then glow with pleasure. This may sound like a very selfish motivation to some, others would understand the power of manipulation. Gradually I began to understand what my very first teachers had tried to explain. Unlike the young today I did not go to a culinary school, rather I was taught by chefs in working kitchens. It was like taking a new recruit, giving him a rifle and dropping him in the middle of a battlefield. Both of my early teachers made me understand that the word 'pleasure' was synonymous with cooking. It was as important for the cook as it was for the one who ate his food. Take pleasure away from either and you only have a drive-through window. Sadly several years ago after some two decades of cooking in four countries the flame that kept pleasure simmering and bubbling went out. Art and food had always been dancing partners, simply look at the background of Antonin Careme, but I became disillusioned with the cute spirals and dashes on plates with little else in substance. Rather than allowing cooking to be nothing more than an automated response without passion or interest I turned to designing gardens and working with natural stone. Opportunity came screaming at me by true accident, on a dare if you wish. In the introduction to Unleash Your Taste I had said that I work in a rather unusual setting for a chef. After years in kitchens today I prepare my recipes in front of the public. No not on television but in a supermarket. Sobeys at Scott and Niagara Street in St. Catharines, Ontario has taken a daring leap forward as far as food retail is concerned. As the in-store chef I work from a station on the retail floor, in full view of customers. Each day I prepare from recipes that are designed to enhance the love of food and to demonstrate how easy it really can be to prepare a healthy and delicious meal in less time than most would think. At my chef's station I can play with the wonderful aroma of fresh herbs and spices, visiting any cultural cuisine at whim. Customers have provided the real joy, and yes the 'pleasure', once again as they drop by to see what's on the menu on any particular day. Sobeys as a retailer has taken a new higher road in the food business, making the most mundane task of food shopping more enjoyable. In a fashion Sobeys has taken the supermarket out of the realm of a drive through and provided a decision and reason for it to be a destination of choice. Each day brings with it the pleasure again. There are times when a recipe is thought of in advance, on other days it is simply a mood or the temperature outside that motivates. Maybe the Deipnosophistae of Athenaeus was right after all and nature, the stars and seasons are a part of preparing food with pleasure and passion. Regardless, it is the people who provide much of the excitement with their willingness to explore taste and desire to recreate for themselves at home. These very same people provided the impetus to develop Unleash Your Taste, and my gratitude extends to each and every one. As a nine year old helping out in my family kitchen I began to believe this, and as a chef of too many years firmly understand it to be true. Anyone can truly cook and it only takes some practice with a dash of daring to reach plateaus of the wow response from family and friends, oh and not to forget, yourself. For now I stand there in the centre of a supermarket retail floor playing daily with smells and taste, enjoying each day. Stop by and take a bite, maybe share an idea as each recipe, (yours or mine), is simply one piece in a puzzle of life.